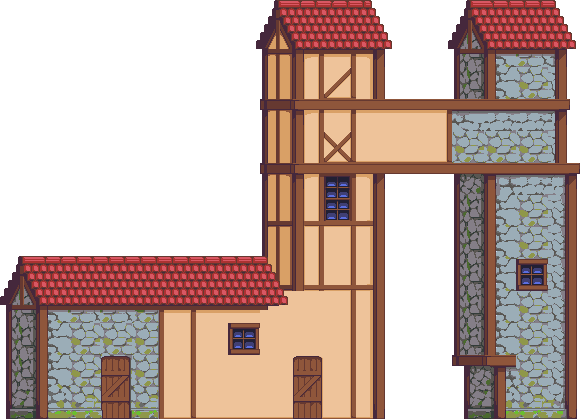 If you want to make new tiles/sprites, do so! Medieval village. 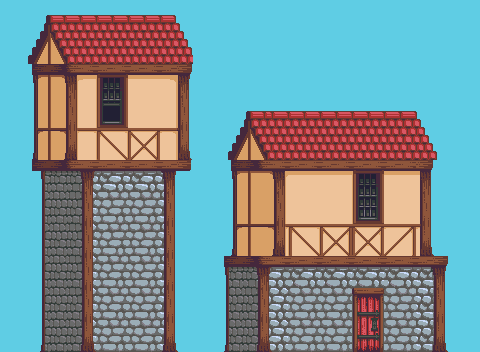 Tudor style houses. If you have better suggestions, you can say so. - Special : paintings! Time to make references and tributes! This work is licensed under a http://creativecommons.org/licenses/by/3.0/deed.en_US - Creative Commons Attribution 3.0 Unported License . All art posted by the owner/creator in this thread will be licensed under a http://creativecommons.org/licenses/by/3.0/deed.en_US - Creative Commons Attribution 3.0 Unported License . What do you mean I copied Hapiel's format? It is easy to get carried away with contrast, since on the first glance things indeed look better with more of it. 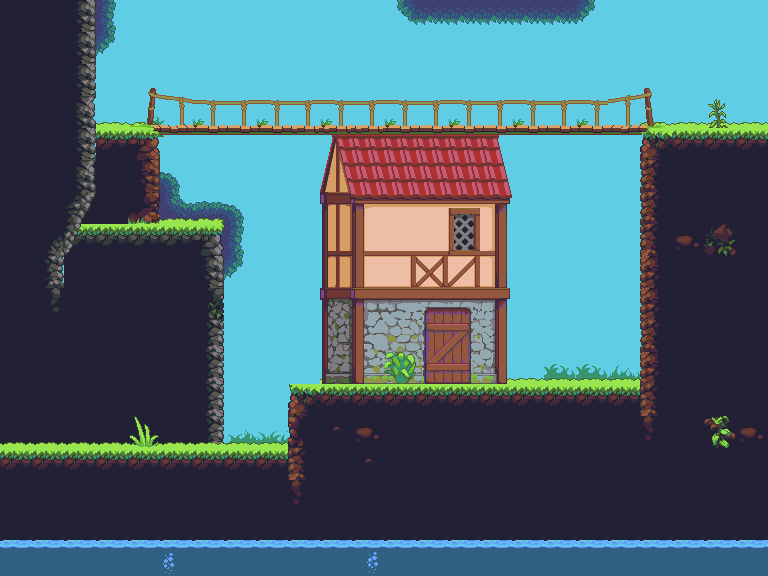 However, background objects need to stay background objects so try to use as little colors as possible! 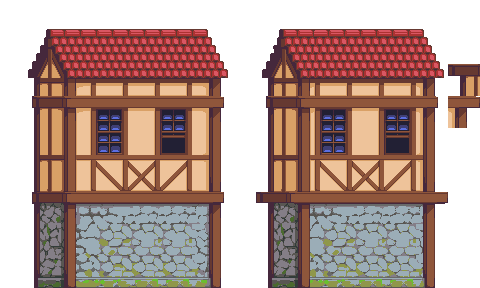 I made an edit on the stone tile and the roof tile. Mine on the left, yours on the right. In the stone tile I removed the highlights and the darkest color is now only in the horizontal rows. In the roof tiles I rearranged them a little bit so that they repeat less often and took out some of the dents and made them slightly irregular. Feel free to copy directly or completely ignore, in the end there will be edits to it anyway. It stays a great base though and sets a clear theme to the set! Notice I edited the picture i sent you last week. I now have a better door, a window and a chimney. Also the plant pot would fit nicely under the window. Daniel, I'm not sure if the changes you've made are that much better, I mean, I can see what you were doing with the bricks and I think you're on to something, but it's not there yet. Otherwise I actually prefer NP's overlapping roof tile and the wider door. I love the wooden beams btw, really great! 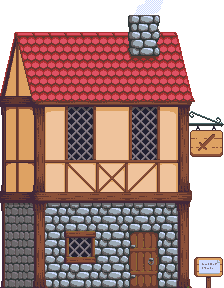 The door in Hapiel's post is actually an older version I did. Oh yeah, the new door and overlapping roof are definitely better :). I indeed edited something older. Also I agree the bricks are not quite there yet, but I bet there will be someone to find the solution! Shouldn't the roof's tiles be slightly tilted to follow the roof's slope? I separated the whole thing in 3 tilesets. This way people can concentrate on 1 whole floor when editing. Here are thing I think could still be improved on each. The roof tiles could indeed be tilted to follow the shape. I already though about that. We could have windows up there too. The upper floors (because we could have many) could have better windows in my opinion. They seem a bit big. I might have tried too hard on the stone wall. But I couldn't get anything good without all those colors. I included both windows (one with and one without the flower pot) to have opinions and help people do their own edit of the flower pot. 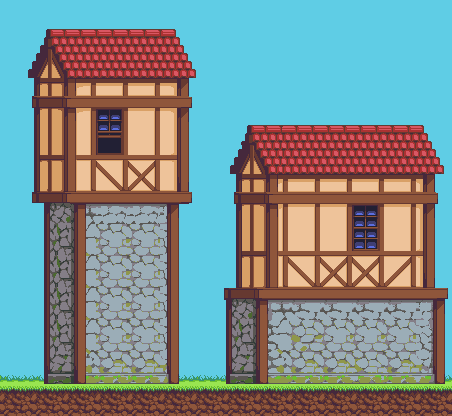 Of course, most decorative stuff done down here will probably end up being stand alone tiles since we're on the ground. 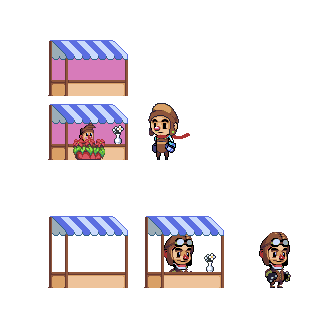 Also, I compared the proportions with our first character and his head ends up 1 pixel higher than the door. I guess we need really big doors. Make some old Celtic cross. I know, that it is not good, but maybe you will advise something about it. 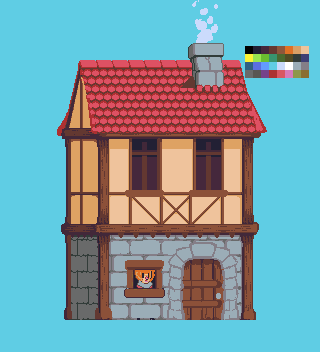 I don't understand about palette, so make it in colors like the house above. A palette is a color scheme, which contains all the colors you will be using. So, you should use, and ONLY use, those colors. For instance, the lightsource comes from the top. The source in your image comes from the top/left. Hope this helps you along the way, and oh... don't give up. We've all been where you are right now, and awesomeness only comes with practice, stumbling, falling, cursing, fixing and trying again. Well maybe not with cursing. I had a lot of fun with these! I'll probably make some more if you guys like what you see! I really like them. Maybe you could make a whole bookshelf. Also we'll have to move them around once we have tables so that they are aligned. Good idea! I'll update this post when it's done. Got it finished! I'm still debating whether we should have a set "Full bookshelf", or a group of books that we can add to it. And back to work I go~! Remake the cross and make some knight mockup. @Ellian I love the table, but the things on top aren't tiled. What if we want to change the setup? @Mishok I don't like the dithering on the grave and it's not cartoony. The grass is barely readable. The knight looks good although the sword looks a bit large. 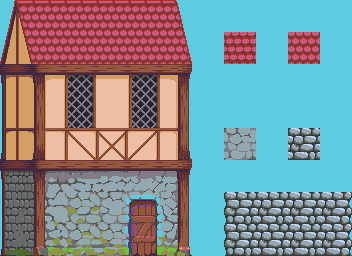 I tried working on the contrast of the stone wall. I agree the highlight is not necessary for background elements but the dark color is needed. It keeps the tile readable. Sorry, I've been totally stupid and made this in a hurry... totally forgot to make the table tile or something. I just realized... 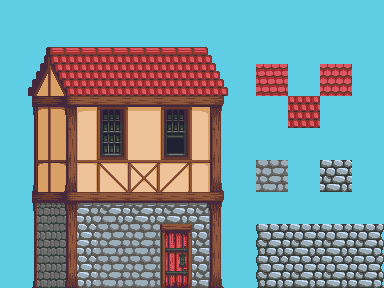 Shouldn't the house have some sort of outline to fit the style of, well, everything else so far? The moss is a great addition too (assuming it's to be refined); maybe some vines or ivy? And the new character is super cute, love him! @A3um great work on the stone wall. I'll try doing some tiles with yours so we can finally use them. I'm not convince with the door, I still prefer my own with the handle. You fooled a bit too much with the hue in my opinion. @Gogglecrab I noticed just now you made an empty bookshelf. I like it. We'll see later about the books. @TylerDurden I like the two big graves. I think they'll work very well. The smaller ones seems too small though and the celtic cross is not there yet. @Everyone We still don't have ground tiles. This is an important asset we need for mashups. I've had this for a while, but never got to finish it because I'm so busy at the moment. Anyway, take from it what you want. 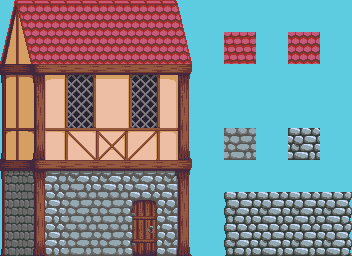 I went ahead and took a shot at a cobblestone road! I'm pretty satisfied with it overall, still not totally set on the little top section though, feel free to make an edit! Why not raise the light stone section to fit in both tiles. This way the character would walk somewhere near the middle of the road. Also remove the dark top section. I don't get what it is and it doesn't feel necessary. Apart from that thanks for the work. Yeah I was originally planning it to be a curb, but as I said before, I wasn't very pleased with it. Good call on that one, I like it better now that he's more down the middle of the road! I did an edit and squeezed the top area a bit. I want to see grass areas too so transitions will be a must. I'm not convinced about the color for the ground but i didn't like dark blue. If anyone can come up with something better I'll be more than happy. Had a go at making a Well, Not sure about the size though, tell we what you think. @TD: You need to review your program settings/work-process, since you have 4-6 almost identical copies of most colors, for a total of 39 in that image. About the well; if you are trying to convey a round well, you could add some perspective and depth by making the center-stones wider and the side-stones narrower and darker. 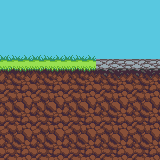 Added a texture to the ground tiles. I edited one background suggestion from the cave set on Pixelation to come up with this. What do you guys think? Also great work on the well but with that many colors, won't it stand out too much. NP, I don't think the ground texture works at all in context of the chosen style. Actually there seems to be incorrect colors in many images...even with a correct palette pasted in the picture. @DB - oh, not again... I guess I should use one file with a correct palette for all my wips. When I edit someone else pic it always ends up like this. I have no clue how to fix this problem... In the beginning I moved all tiles to my master file (assuming that grafx2 does not screw up colors though I do often save as png not gif...), but not things are everywhere. Also there seems to be a little bug in grafx2, if you try and remap a brush or image it sometimes does not select the correct colors. However, if you make a copy of the palette (so that it is there twice, check many of the original jungle submissions they have this) this problem does not exist any more. Either way, who is going to write software to batch fix all images at once to have the same palette? Also, is there someone who could upload/organize all the current village stuff, wip or not, to the http://opp.danielsiegmund.nl - OPP wiki ? Also, is there someone who could upload/organize all the current village stuff, wip or not, to the http://opp.danielsiegmund.nl - OPP wiki? "Also there seems to be a little bug in grafx2, if you try and remap a brush or image it sometimes does not select the correct colors." Think you're confused about something here; I remap in Grafx2 every day without problem (well, there's a small index issue, but colors (rgb-values) are fine). To remap: Load the new palette/image into the spare, select [Palette and Remap] in the [Go / Copy to other page]-menu ("two papers" button). Are you doing it any other way? If you have specific example of when you believe things go wrong, please describe it. PNG shouldn't change your colors, at least not if you stick with PNG-8: If corruption happens; it may be your program or settings. The stuff that is in the middle is supposed to be slime or something. Quick NPC character I plan to have doing some playing animations for in the village. Poop hair. Why are these guys so much smaller then the main dude. I think we could repurpose those designs and turn them into gnomes, we just need to change the poop hair to a red cap! Well sh*t. Gnomes it is! I read the hair as a villagers hat. It wasn't until I was making the mechanic that I started getting suspicious about the size difference. 7 year old mother could be a new MTV series. 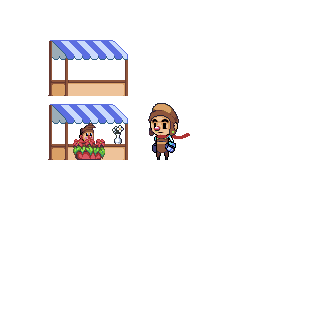 Is a market stall ok? I might make it taller so it seems more proportionate, but I kinda like the idea. I agree that taller would make more sense. Made this a while back as an edit, forgot to post it. 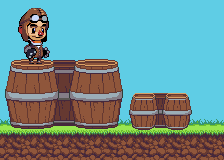 I felt that the wooden poles needed to be exaggerated in size to fit the exaggerated characters and style we're going for. It might need more contrast in areas though. What about this 2 signboards? So I started to revise the hanging sign to get it at the same angle as the building, and then the next thing I knew there was a new window! Just noticed the chimney isn't in perspective. Also, that sign looks good. I played around with the door and roofing today. I feel that my roof tile needs some softening. It seems too bold to me. 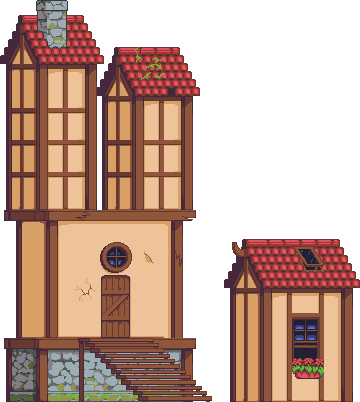 Also I had the idea that flower boxes for the windows could offer both decorative and platform options. indeed, flower boxes as platform would be cool. I think the middle roof is bolder than before, but I like both. Alright! 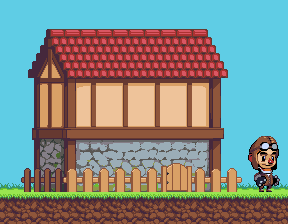 I believe I'm done messing with the roofing. 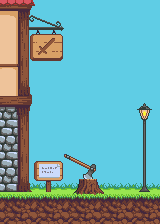 I'm liking the axe and stump. Perhaps the axe handle could use a slight curve to it? Thats a pretty sweet cart Melanke. Love how the roof turned out. My only critique right now on the house would be the door, there seems to be a lot of noise, maybe something more chunky in clusters would be better. I'd also like to see it compared to a character for comparison, because right now width wise it looks a bit small. I like this door, but think it can be used as a dungeon door, it feels a little bit macabre. My girlfriend says the Hay looks like "Goku hair"
Haha Thanks, I really believe in this project. 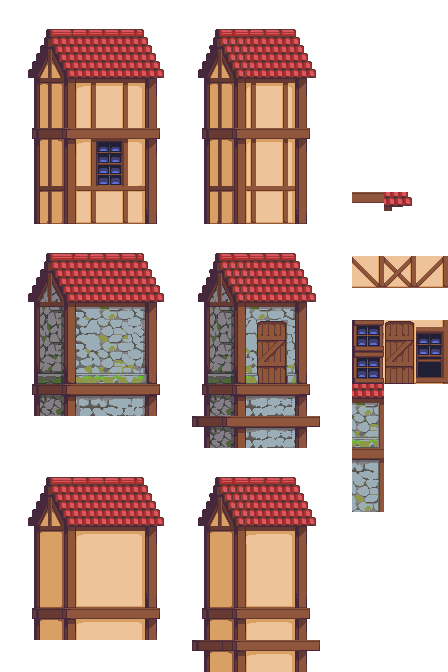 I think what motivates me more is dreaming about my next game using this assets. I touched up the windows and made an open variant. I also played around with the hay cart, but didn't seem to get anywhere. Later on I'll try again. I couldn't remember my password for the forums so I haven't been able to post for a few days. 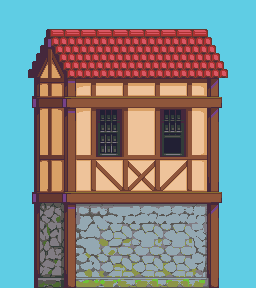 Anyway, I've thought that the house doesn't really fit the style anymore (it doesn't look as 'clean'). SO what I did was try and update some of the old stuff to look more in style with the one going on in the jungle-set. The forward facing stone part of the house isn't tiled or something, it's just a copied part of what a3um did (I liked that look). Here it is. Kazen, I don't know, this style looks like a little bit unfinished, or maybe I am too used to the style we are working on. We will have to debate on which style we should go with. In the mean while I think I came up with an interesting way to create different configurations of the house. Kazen, that all looks great. I think the cleaner (house 2) is better in terms of style, however not perfect yet. I'm not sure the bright purple works as a second light source though. I prefer the bigger door, but is it too big? I'd get a character in there for reference. I really like the roof on the first house though. There is a vast improvement from when Melanke started working on the house again. With you guys working on this and the quick process, I can see the first basic house being finished soon and its variants soon after. Keep it up, and if I have the time I will join too. I didn't touch the stonebrick wall but what about this wood modifications? I think we have to move together on this house, let's all agree with every single piece and move to the next piece. Starting by the wood, then the roof, then the stonebrick wall and on and on. Nice, I think we all agree this roof is THE roof, right? This just occurred to me. Should the fountain be adjusted for platform use? So I started playing around with the idea of the fountain also serving for platforming and here's what I've got so far. Originally I was thinking the top ridge of the hourglass shape could serve as a platform, but since that doesn't seem plausible to me now, I'm thinking that some gargoyle water spouts could be a good way to add platforms to the fountain. Here's the fountain so far. I don't have time to really do anything right now, but a quick glance would suggest that there are a lot of duplicate tiles. 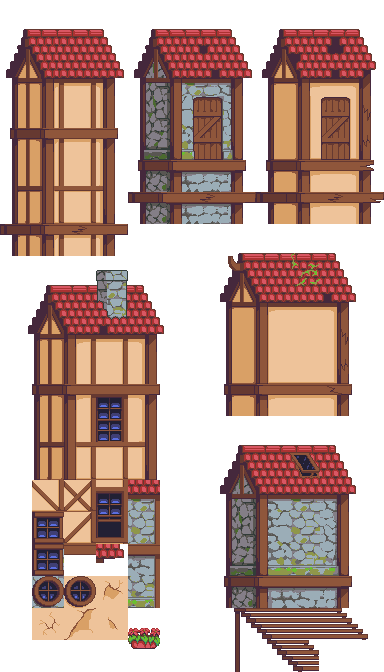 For example, when I look at these, there's currently six roof-tops, where four looks the same, with minor alterations. 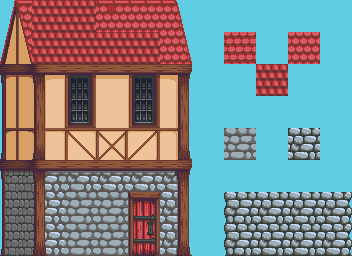 If you could reduce them all so there's no duplicate tiles, that would be much better (even my revision has duplicate tiles for roof and rocks, I was thinking to make variations on the repeated tiles though). I do like that you can create many different forms though, like the mock. In particular that you can go from roof to tower is a nice touch and can break up the variation a lot. The flexibility of this house is awesome! I will take a break working in the house for now, so you can work on it without worrying about version conflicts.